Gotcha! - Welcome to The City of Desire. It stopped for me at last tonight. What a lovely swallowtail butterfly! 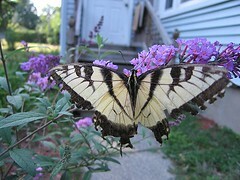 It's definitely because of the butterfly bush. It's called that because its flowers attract butterflies.